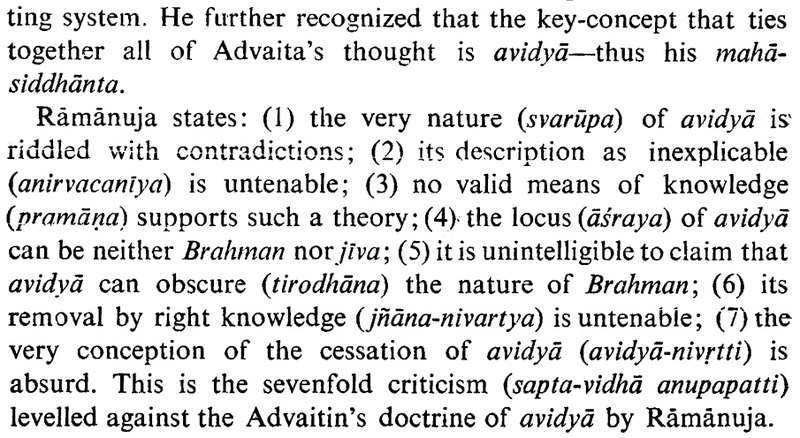 What is Sapta Vidha Anupapatti or what are the seven untenables? Though a quick search gives the list and some description of those 7 Anupapattis at advaita-vedanta.org archives. Who has written the work "Sapta Vidha Anupapatti"? Is the work written by Sri Ramanujacharya or Sri Vaishnava Acharya? I found one google book authored John A. Grimes. So, is the work carried out by him i.e Did he coin the term "Sapta Vidha Anupapatti" or has Sri Ramanujacharya used that term? Is the work based on Sri Bhashya or Satadushani? Where Ramanujacharya mentioned those Anupapatti in his bhashya? As described above, it is not a separate work but a subsection in the Mahasiddhanta of the Jijnasadhikarana section of Ramanuja's Sribhashya. Did John Grimes coin the term "Sapta Vidha Anupapatti" or has Sri Ramanujacharya used that term? The term sapta-vidha-anupapattayaH itself doesn't appear in the Sribhashya itself but is commonly found under the table of contents of printed editions of the Sribhashya, as well as in the form of section-headings within the text. It appears to be an artifact of the book editors for the reader's convenience. I haven't found the terms in Sudarsana Suri's Srutaprakasika or Rangaramanujamuni's Bhavaprakasika. I will update this answer if I find out that some post-Ramanuja author has used this term in their work. 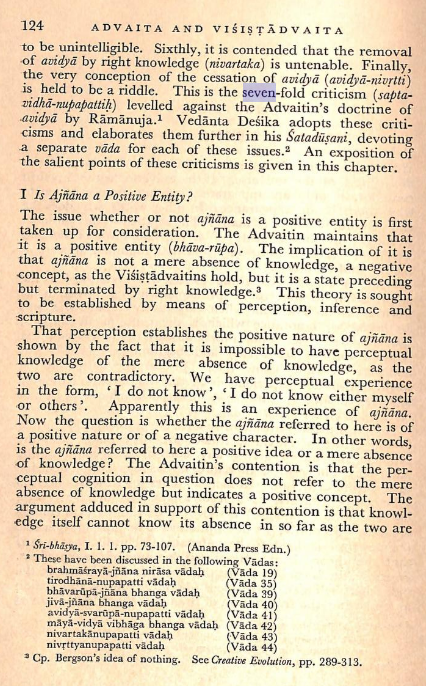 As mentioned above, the actual criticisms appear in the Mahasiddhanta section of the Sribhashya opening. The Satadushani (100 faults) devotes seven separate vadas (arguments) for each of Ramanuja's criticisms. Not the answer you're looking for? Browse other questions tagged philosophy vishishtadvaita ramanujacharya ignorance .